It takes a very smart or very stupid person to plan a recipe around a slightly odd ingredient they’ve never tasted before. You be the judge (literally, for a week after January 24th, you can vote here…please vote for me…specifically THESE). Three little cupcakes, all in a row...actually, these are the bigger ones. I’d been noticing a lot of posts about a practically magical winter fruit that I’d never met in person before: the quince. From what I’d read and seen, I gathered that it was very similar to a pear or apple, only it smelled better and was utterly inedible (and white on the inside) without a long, hot bath in some sugar syrup (after which it would also be pinkish). Hmm…poached quince…not too different from poached pears, I bet…and what do we poach pears in? Yes, that would be wine, which as I am all too aware, is the theme for this month’s Iron Cupcake. I decided to re-use the recipe for the Chardonnay cupcakes, only omitting the vanilla extract and nutmeg. 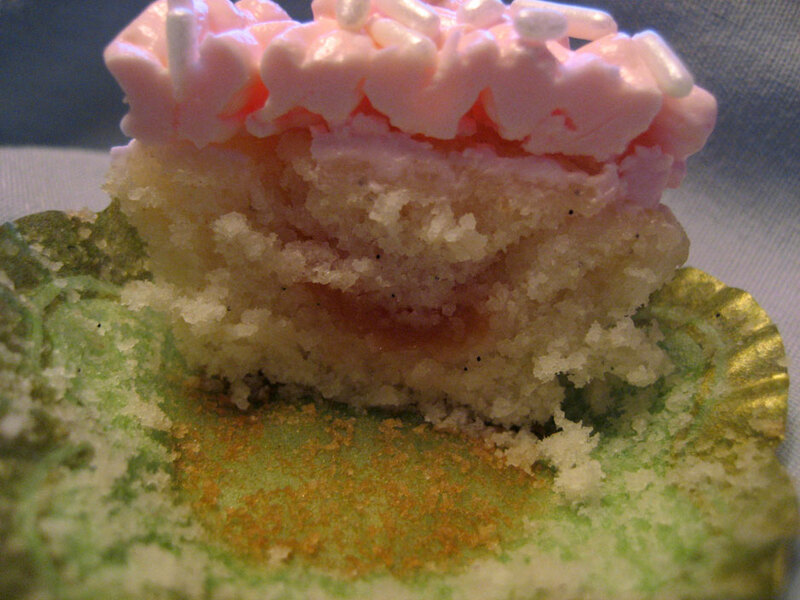 In their place, I used the insides of a long, fat, juicy Madagascar vanilla bean, opting to keep the cake simple. I also cooked them slightly less than the first batch, because I wanted to keep them as soft as possible. I also stored them on the counter, lightly covered with plastic wrap, for a full 24 hours before filling and frosting. They are extra moist and lack the caramelized crust around the edge. They hold up just fine to refrigeration and freezing (they come to room temperature in about 5 minutes when refrigerated and are just as soft), which is pretty important since being able to freeze the frosting on them as soon as it was applied was a pretty big deal. Yes, they’re tiny buttercream roses (well, not so tiny in the case of those giant ones on top…there’s only a few of those). No, I’ve never done them before. I just had a lot of tiny lopsided mini cupcakes to practice on. And had to switch to the cloth pastry bag that belonged to my grandmother…great grandmother? The seam around the tip of the cheap plastic pastry bag I had been using split, and I had to switch to a bigger petal tip. 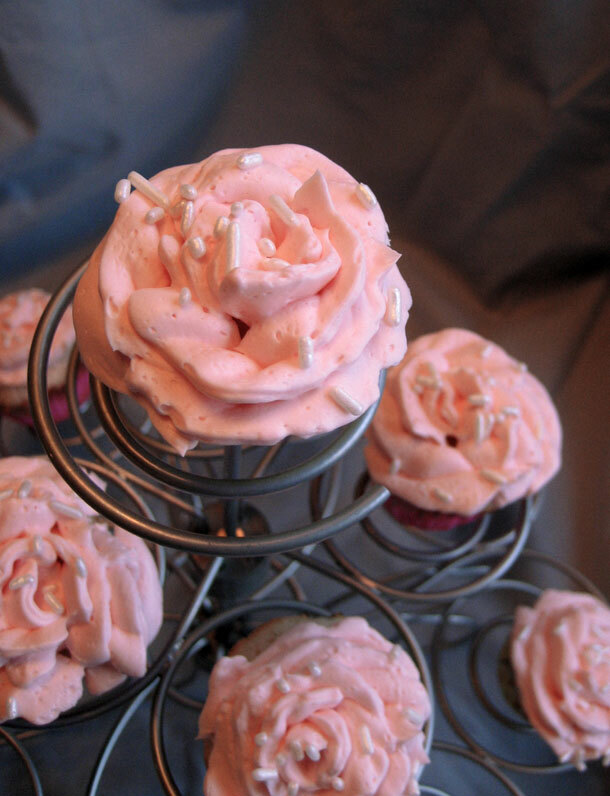 But it worked so much better and some of the cupcakes even kind of looked like roses! 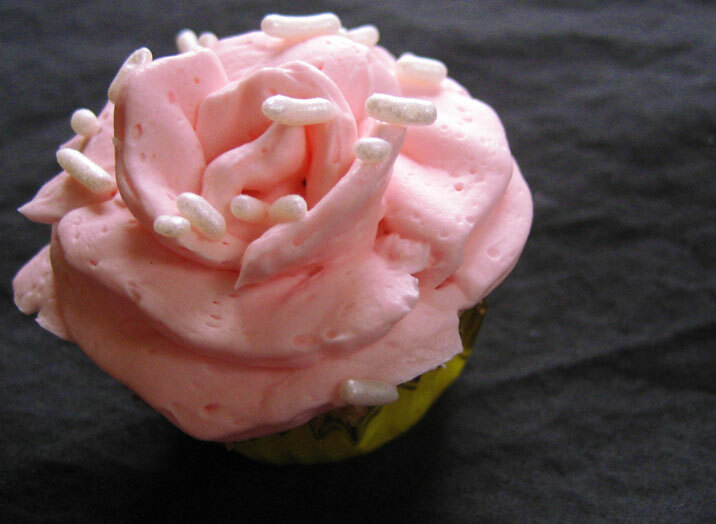 So you can see there what I did with the quinces (which are as magic as they seem…they’re covered with tufts of fuzz and smell like the sweetest pear candy ever, but are completely inedible until you cook them), but why did I want roses on the tops of my cupcakes? For practice? As a cute vehicle for those great pearlescent jimmies? To do justice to the adorable cupcake papers? I would have liked to have photographed these outside in the grass...but this is Maine and there is a blizzard outside. None of the above. 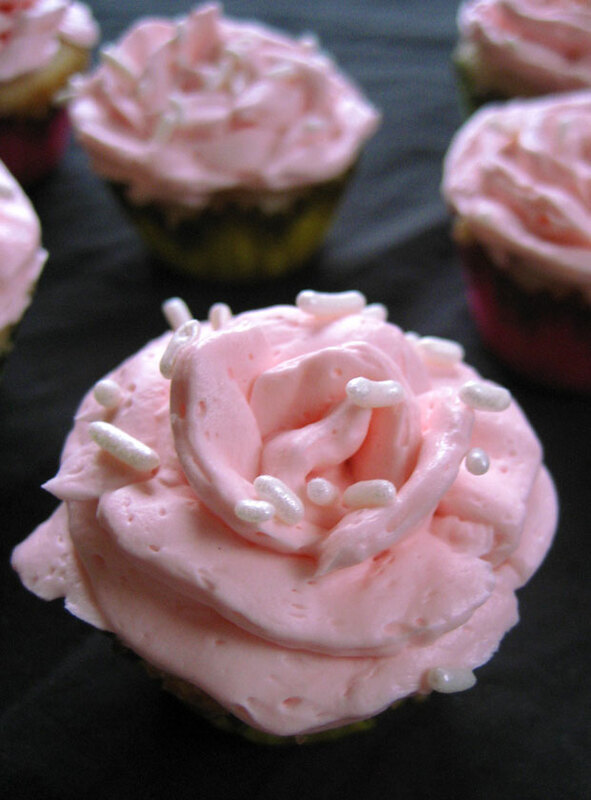 The frosting is rose flavored! 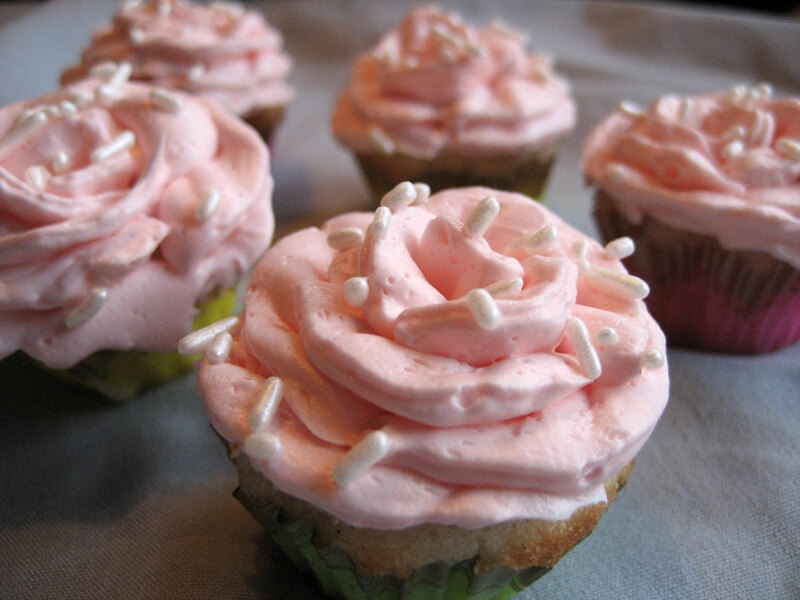 It is also a light and airy Swiss meringue buttercream (based on Joe Pastry’s recipe). 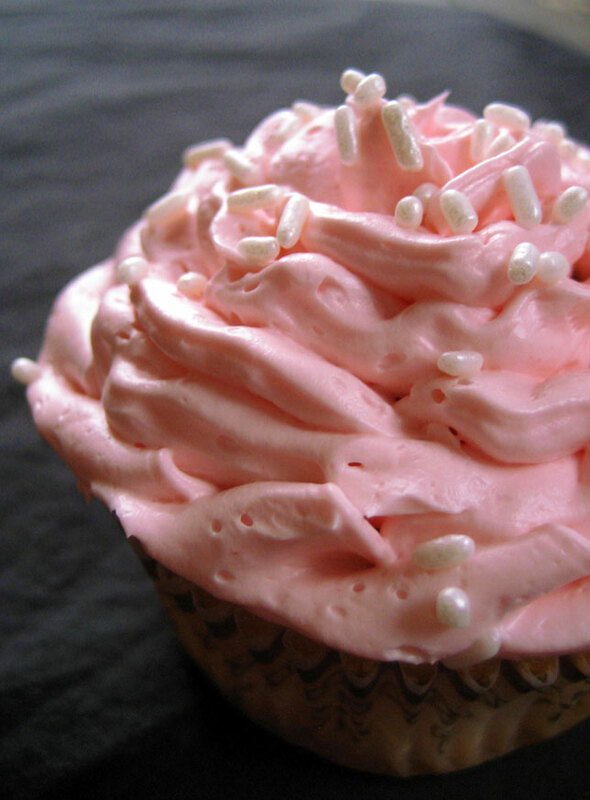 While I liked the French buttercream for the Merlot cupcakes, I didn’t want something that rich. Besides, I needed yolks for some upcoming creme brulee! I wish I had a garden tea party to take these to! There used to be a recipe here, but since I am SO in love with these cupcakes and the voting is closed, I’ll be keeping this one to myself from now on. If you are really interested, just ask and I may share it with you. 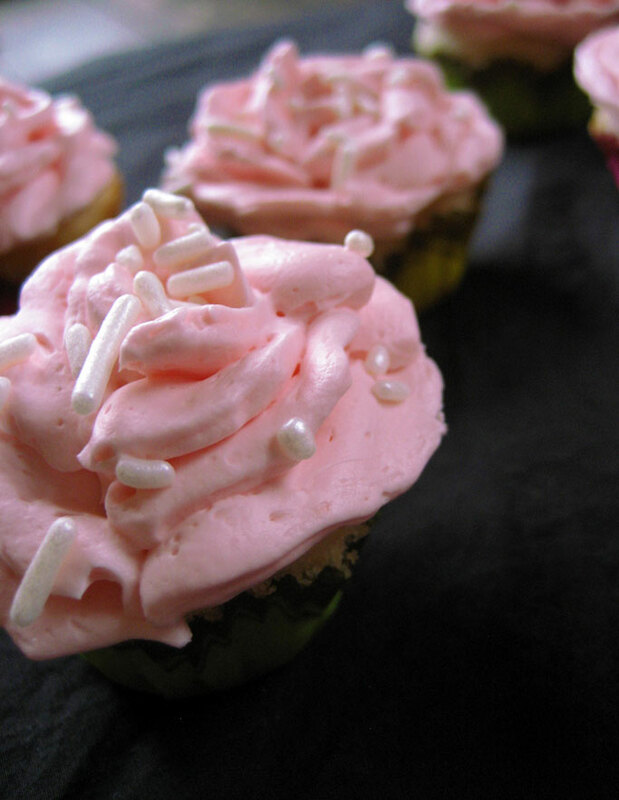 It’s just that if I ever end up opening a business that sells cupcakes, I’m going to want to put these on the menu at some point, and I’m going to want to retain the rights to my original recipes. Based on my notes above, you can pretty much figure out how I made these anyway. What’s the verdict? Well, I pretty much love them. 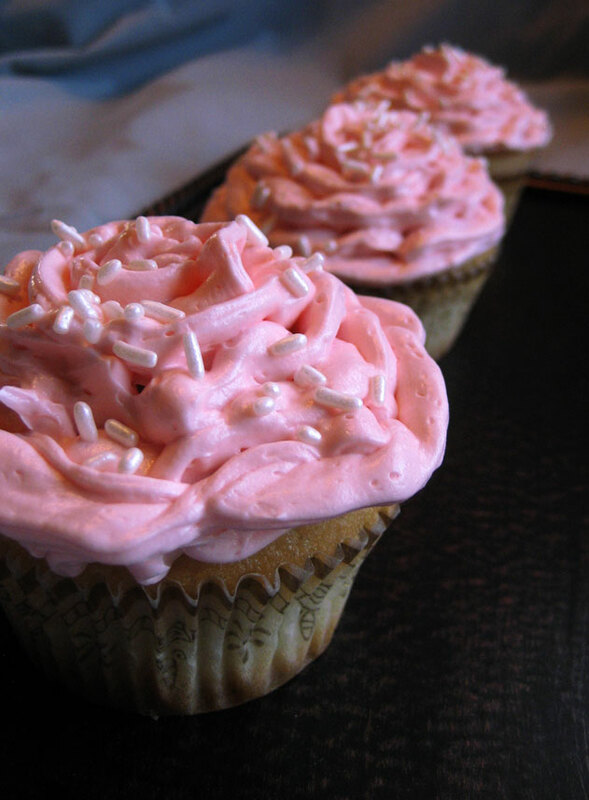 These cupcakes are quite fruity from the wine and the quince, and two of my favorite things to eat are fruits and flowers. Z thinks they are good, though too fruity and girly for him. I ought to be coming through town on Monday morning, so if you see me and you like ridiculously fruity, girly, tiny cupcakes, try to snag one…and then vote for me later! I thought I was going to keep it to two entries this time, but I just received an ingredient from my mom that qualifies for this challenge. 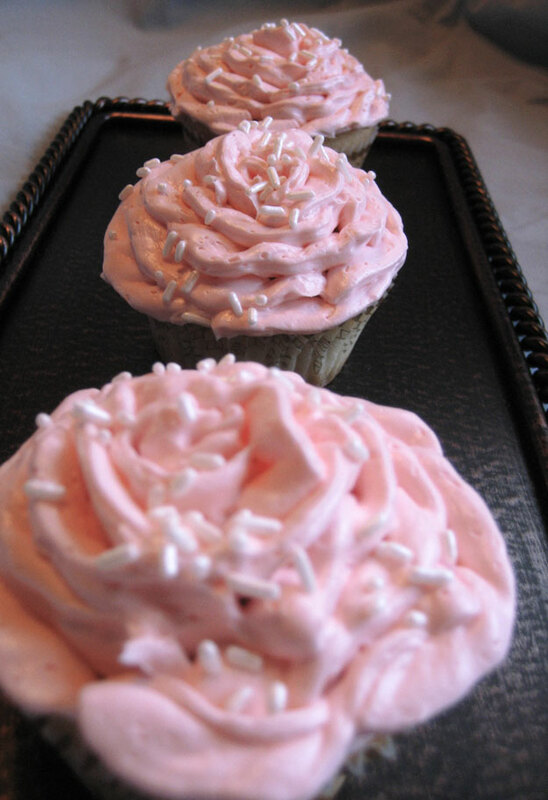 If I add the rose buttercream (or just the rose flavor), plus another, trickier (to locate) ingredient, I’d have a famous flavor combination that I haven’t had a chance to taste myself but would love to try. I think I'll eat this guy tonight. Those are some fancy looking cupcakes, they sound delicious! These look wonderful. What a creative idea! And the presentation is so elegant! These are beautiful! Well done! You are a very patient person. I would love to have these at a garden tea party. Thanks for the post.